The striped cuckoo is found in open country with trees or shrubs, and the edges of mangrove forests. 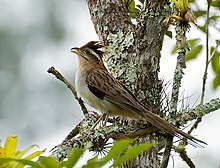 It is among the very few brood parasitic cuckoos of the Americas (only other are Dromococcyx), and typical hosts are spinetails, but often also wrens, and other species with domed nests. The female cuckoo lays one, sometimes two, white or bluish eggs in the host's large stick nest. The eggs hatch in 15 days, with a further 18 days until the cuckoo fledges. The young spinetails disappear. Matita-pereira is famously mentioned in Tom Jobim's song Águas de Março. ^ BirdLife International (2012). "Tapera naevia". IUCN Red List of Threatened Species. Version 2013.2. International Union for Conservation of Nature. Retrieved 26 November 2013. ^ "Família: Cuculidae Espécie: Tapera naevia". Archived from the original on September 27, 2007. ^ "Sociedade dos Observadores de Saci". SOSACI. 2007-01-08. Retrieved 2013-03-01. Wikimedia Commons has media related to Tapera naevia. "American striped cuckoo media". Internet Bird Collection. This page was last edited on 23 April 2019, at 11:51 (UTC).